The landing page for a course should be friendly, engaging, and intuitive to use. 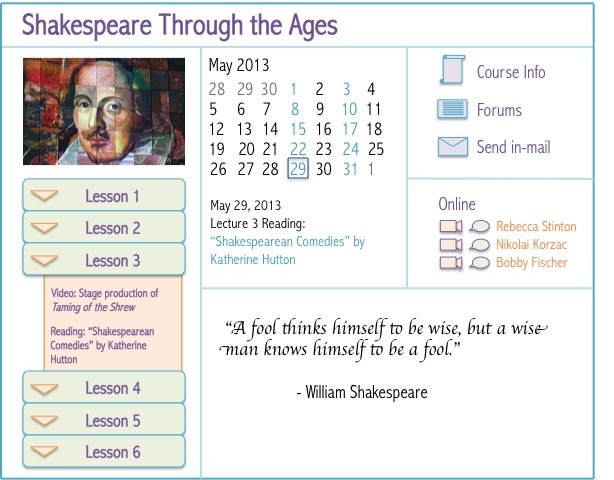 In this mock-up of the Shakespeare Through the Ages course, the student can easily see and access lessons, assignments, due dates, and course info. There are also many options to easily collaborate with peers: forums, private messages, chat, and hangout. These latter three would only be available options if students on the receiving end choose to allow access. Now let’s say students click on the reading assignment, “Shakespearean Comedies,” for Lesson 3.